With the 110th edition of Milan-San Remo, the first major spring classic was on Saturday, which was won by blood-stricken Julian Alaphilippe. Read the reactions in our live blog. Finish between 4.45 and 5.15 p.m. FINISH - Alaphilippe wins! The Frenchman beats Peter Sagan, among others, and triumphs in Milan-San Remo. Oliver Naesen is second, Michal Kwiatkowski finishes third. It is already the seventh victory of the season for Alaphilippe. Still 0.9 km - Mohoric tries to drive away from the top group, but his attack is parried by several riders. 1.8 km to go - Trentin is attacking. Sagan parries and can close the gap. Another 3.4 km - Dumoulin joins the leading group, which now consists of eight riders. A number of riders are also trying to make the jump. Still 5 km - A number of riders are leaving the peloton: Peter Sagan, Wout van Aert, Oliver Naesen, Matteo Trentin, Alejandro Valverde, Julian Alaphilippe and Michal Kwiatkowski. Tom Dumoulin drives just behind the front runners. 7 km to go - The peloton is being torn apart. Groenewegen tries to hold on, but the Dutch sprinter has difficulty keeping up with the lightning fast pace. 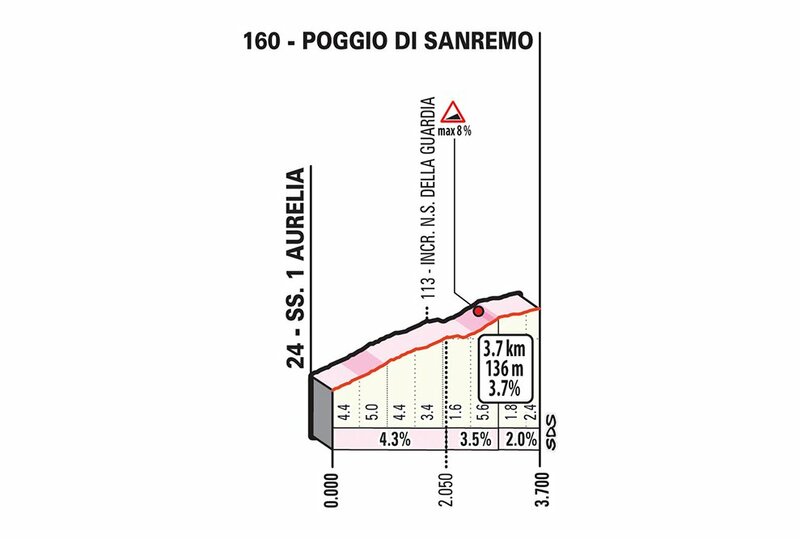 Another 10 km - The riders start the last climb of the day, the Poggio. Bonifazio is captured by the peloton. 13 km to go - Bonifazio's lead is slightly up. The Italian is 22 seconds ahead of the peloton. 15 km to go - Bonifazio's attack has given him a 15-second lead. His mission does not seem likely to succeed. Another 17 km - Niccolò Bonifazio attacks in the descent. The Italian drives away with great risk on his own. Groenewegen seems to have survived the climb and is sitting in the back of the pack. Another 22 km - Groenewegen has difficulty following the climb. The Dutchman hangs in the back of the pack. 25 km to go - Everyone rides together again! Masnada is doing everything it can to stay ahead of the pack, but that attempt is hopeless. Another 30 km - We get the Cipressa, a 5.5 kilometer long climb with an average gradient of 4.1 percent. It will be interesting to see how the sprinters are doing. Masnada is still in the lead alone. 38 km to go - Movement in the leading group! Schönberger places an attack and gets company from the Italian Fausto Masnada, who then runs away on his own. His lead over the peloton is more than a minute. 40 km to go - In this little uplifting 'La Primavera' we slowly go to the denouement. The lead group's lead is only a minute and a half. It does not seem to be long before the refugees are caught. 60 km to go - The peloton increases the pressure on the front runners while enjoying the sun. The lead of the first ten, which was once ten minutes, is now less than three minutes. Another 75 km - It is almost finished with the completely flat roads. The riders are approaching the Capo Mele, Capo Cervo and Capo Berta. It doesn't mean much; the most challenging climb is the Capo Berta with a gradient of up to 4.1 percent. The sprinters are only really tested in the final phase. 84 km to go - Under the leadership of the sprinter teams, the pace in the peloton increases and the lead of the leading group shrinks. The ten refugees still have a margin of more than four minutes. Still 106 km - We are again in a flat part of the race and so it is mainly the environment that stands out. The lead of the ten front runners is still just over five minutes. Still 136 km - Tom Dumoulin has to do the rest of the race with a teammate less. The Dane Casper Pedersen gets off and the rider from Team Sunweb is the second drop in this Milan-San Remo. Another 140 km - We are now halfway the race and the lead of the leading group is shrinking at an increasingly rapid pace. The ten refugees are just over five minutes ahead. 145 km to go - The peloton is now accelerating the pace, thanks to the leaders of UAE Emirates, Deceuninck-Quick Step and BORA-hansgrohe. The lead of the leaders is reduced to 6.5 minutes. 173 km to go - The leading group is approaching the foot of the Turchino, a climb of no less than 25 km. Incidentally, the increase percentages do not exceed two percent, so this obstacle should not be a problem. Another 186 km - The first dropout in the race is a fact. The dubious honor goes to the Belgian Nathan Van Hooydonck, teammate of Greg Van Avermaet at CCC. Van Hooydonck suffers too much from stomach problems that have been troubling him for several days. The lead of the leading group has since fallen somewhat to more than 7.5 minutes. 206 km to go - On the flat Italian roads the riders have enough time to enjoy the beautiful landscape, such as here in Tortona. Still 210 km - The image is fairly monotonous in 'La Primavera'. We have a leading group of ten that is still slightly more than eight minutes ahead of the pack. For the necessary excitement, wait until the first climb, which is 140 kilometers from the finish. Still 237 km - A striking fact of the Novo Nordisk cycling team, which has no fewer than four riders in the top group of ten. The American formation drives races with the aim of calling attention to diabetes. The four refugees from Novo Nordisk all have diabetes. Julian Alaphilippe is one of the favorites for the victory in Italy. The Frenchman of Deceuninck-Quick-Step already booked day victories in the Tour of San Juan (two), the Tour of Colombia (one) and the Tirreno-Adriatico (two) and he won the Strade Bianche. 247 km to go - The peloton is visibly shocked by the big lead of the leading group and is making a difference. The margin drops from more than ten minutes to 8.5 minutes. 260 km to go - The peloton makes no effort to get the refugees back, increasing the lead of the leading group to more than ten minutes. Another 282 km - It looks like we have a leading group. A group of ten escaped the pack and has a one-minute lead over the large group. Among the refugees are no fewer than four Novo Nordisk riders and six Italians. Start - We are officially released in 'La Primavera'! Only 291 kilometers to go for the riders, who can take it easy on the flat 140 km of flat Italian roads. Who is going to win Milan-San Remo? Ten minutes left until the start. Team Sky has a former winner with Pool Michal Kwiatkowski. The last Dutch winner of Milan-San Remo was Hennie Kuiper in 1985. Jan Raas (1977) and Arie den Hartog (1965) preceded him. With Dylan Groenewegen, the Netherlands has an outsider for the win this year. This is the route of this edition of Milan-San Remo. The first half of the trail is almost completely flat. Can the sprinters survive until the finish?